For other uses, see Dwarf. 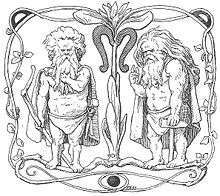 Two dwarfs as depicted in a 19th-century edition of the Poetic Edda poem Völuspá (1895) by Lorenz Frølich. In Germanic mythology, a dwarf is a small humanoid that dwells in mountains and in the earth, and is variously associated with wisdom, smithing, mining, and crafting. Dwarfs are often also described as short and ugly, although some scholars have questioned whether this is a later development stemming from comical portrayals of the beings. The concept of the dwarf has had influence in modern popular culture and appears in a variety of media. The modern English noun dwarf descends from the Old English dweorg. It has a variety of cognates in other Germanic languages, including Old Norse dvergr and Old High German twerg. According to Vladimir Orel, the English noun and its cognates ultimately descend from Proto-Germanic *đwerȝaz. Beyond the Proto-Germanic reconstruction, the etymology of the word dwarf is highly contested. Scholars have proposed theories about the origins of the being by way of historical linguistics and comparative mythology, including that dwarfs may have originated as nature spirits, as beings associated with death, or as a mixture of concepts. Competing etymologies include a basis in the Indo-European root *dheur- (meaning 'damage'), the Indo-European root *dhreugh (whence, for example, modern English dream and German Trug 'deception'), and comparisons have been made with Sanskrit dhvaras (a type of "demonic being"). Modern English has two plurals for the word dwarf: dwarfs and dwarves. Dwarfs remains the most commonly employed plural. The minority plural dwarves was recorded as early as 1818, but it was popularized by the fiction of philologist and author J. R. R. Tolkien, originating as a mistake (hypercorrection) and employed by Tolkien since some time before 1917 (for Tolkien's beings, see Dwarf (Middle-earth)). Regarding the plural, Tolkien wrote in 1937, "I am afraid it is just a piece of private bad grammar, rather shocking in a philologist; but I shall have to go with it". Norse mythology provides different mythical origins for the beings, as recorded in the Poetic Edda (compiled in the 13th century from earlier traditional sources) and the Prose Edda (written by Snorri Sturluson in the 13th century). The Poetic Edda poem Völuspá details that the dwarfs were the product of the primordial blood of the being Brimir and the bones of Bláinn (generally considered to be different names for the primordial being Ymir). The Prose Edda, however, describes dwarfs as beings similar to maggots that festered in the flesh of Ymir before being gifted with reason by the gods. The Poetic Edda and Prose Edda contain over 100 dwarf names, while the Prose Edda gives the four dwarfs Norðri, Suðri, Austri and Vestri (Old Norse 'North, South, East, and West') a cosmological role: they hold up the sky. In addition, scholars have noted that the Svartálfar (Old Norse 'black elves') appear to be the same beings as dwarfs, given that both are described in the Prose Edda as the denizens of Svartálfaheimr. Very few beings explicitly identifiable as dwarfs appear in the Poetic Edda and Prose Edda and have quite diverse roles: murderous creators who create the mead of poetry, 'reluctant donors' of important artifacts with magical qualities, or sexual predators who lust after goddesses. They are primarily associated with metalsmithing, and also with death, as in the story of King Sveigðir in Ynglinga saga, the first segment of the Heimskringla — the doorways in the mountains that they guard may be regarded as doors between worlds. One dwarf named Alvíss claimed the hand of Thor's daughter Þrúðr in marriage, but he was kept talking until daybreak and turned to stone, much like some accounts of trolls. After the Christianization of the Germanic peoples, tales of dwarfs continued to be told in the folklore of areas of Europe where Germanic languages were (and are) spoken. In the late legendary sagas, dwarfs demonstrate skill in healing as well as in smithing. In the early Norse sources, there is no mention of their being short; in the legendary sagas, however, they are "small and usually ugly". Anatoly Liberman suggests that dwarfs may have originally been thought of as lesser supernatural beings, which became literal smallness after Christianization. Old Norse dwarf names include Fullangr ('tall enough') and Hár ('high'), whereas Anglo-Saxon glosses use dweorg to render Latin terms such as nanus and pygmaeus ('pygmy'). Dwarfs in folklore are usually described as old men with long beards. Female dwarfs are hardly ever mentioned. Dvalinn the dwarf has daughters, and the 14th-century romantic saga Þjalar Jóns saga gives the feminine form of Old Norse dyrgja, but the few folklore examples cited by Grimm in Teutonic Mythology may be identified as other beings. However, in the Swedish ballad "Herr Peder och Dvärgens Dotter" (Swedish 'Sir Peder and the Dwarf's Daughter'), the role of supernatural temptress is played by a dwarf's daughter. The Anglo-Saxon charm Wið Dweorh (Against a Dwarf) appears to relate to sleep disturbances. This may indicate that the dwarf antagonist is similar to the oppressive supernatural figure the mare which is the etymological source of the word "nightmare", or possibly that the word had come to be used to mean "fever". In the Old English Herbal, it translates Latin verrucas, warts. Lotte Motz theorized that the Germanic dwarfs, particularly as smiths and gatekeepers, constituted a reminiscence of the Megalithic culture in Northern Europe. John Lindow noted that stanza 10 of the Poetic Edda poem Völuspá can be read as describing the creation of human forms from the earth and follows a catalog of dwarf names; he suggests that the poem may present Ask and Embla as having been created by dwarfs, with the three gods then giving them life. 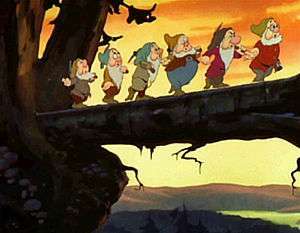 The famous sequence where the seven dwarfs sing "Heigh-Ho" in the 1937 film. There were seven dwarfs in the Brothers Grimm's fairy tale Snow White. The Walt Disney Company's 1937 film based on the story, the first feature-length animated film, is the best known adaptation today. Dwarves also appear in many fantasy MMORPGs as a playable race. In the Prose Edda, the dwarfs are equated with the svartálfar and dökkálfar ("dark elves"). In J. R. R. Tolkien's The Lord of the Rings, the dwarves (Tolkien's spelling) and the Elves of Darkness or Moriquendi are distinct. They are also present in C. S. Lewis's The Chronicles Of Narnia, in both the books and the film adaptations. Most modern fantasy media have continued this distinction, beginning with TSR's Dungeons and Dragons. Dungeons and Dragons calls the dwarfs "dwarves" and the dark elves drow, which is derived from the Scottish word trow, according to Gary Gygax. 1 2 3 4 Simek (2007:67–68). 1 2 Gillver, Marshall, & Weiner (2009:104-108). ↑ Simek (2007:305), Orchard (1997:35), and Hafstein (2002:111). ↑ Motz (1983:90–91, 105–06); Gundarsson (2007:81, 83). 1 2 3 Griffiths (1996:54). Gilliver, Peter. Mashall, Jeremy. Weiner, Edmund (2009). The Ring of Words: Tolkien and the Oxford English Dictionary. Oxford University Press. ISBN 9780199568369. Jakobsson, Ármann (2005): "The Hole: Problems in Medieval Dwarfology," Arv 61 (2005), 53–76. Schäfke, Werner (2015): Dwarves, Trolls, Ogres, and Giants. In Albrecht Classen (Ed. ): Handbook of medieval culture. Fundamental aspects and conditions of the European middle ages, vol. 1. Berlin: de Gruyter, pp. 347–383. Wikimedia Commons has media related to Dwarves in Germanic mythology.